A gunman has opened fire at a local newspaper in Maryland, killing five people and wounding many more. 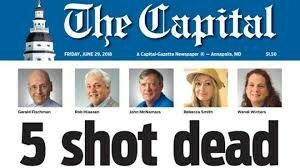 Staff at the Capital Gazette Newspaper in Annapolis said he shot through a glass door into the newsroom. Reporter Phil Davis tweeted, “there is nothing more terrifying than hearing multiple people get shot while you’re under your desk and then hear the gunman reload”. Police said a suspect was now in custody and was being questioned. County Executive Steve Schuh said in a news conference there are several people who have died from this incident. Police said they could not identify the exact weapon at the time. They said the suspect was being interrogated by law enforcement. Several federal agencies, including the FBI, were involved in responding to the shooting in the city of Annapolis, just east of Washington DC.